I was auctioning off my number one fan spot this week on ebay and it would have relevant ads at the bottom of the auction page. I am assuming this was based on key words in the description of the auction. That’s right. 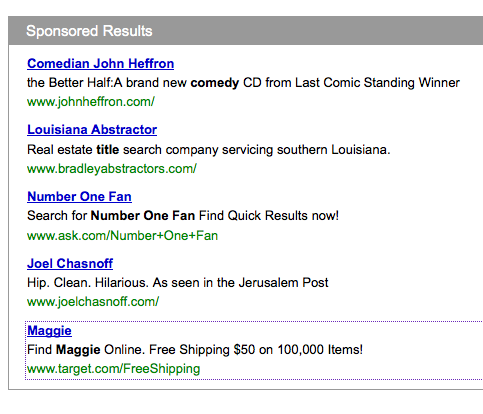 905 items, when you search “Maggie” at Target. The whole first page were bags and purses. actually most of the pages were purses and bags. So now, in addition to “Maggie” being the most popular name of all dogs everywhere. I am a purse. I have decided to ask my friend Tivoli, who works at Target, and I do believe at some point, was a bag designer, what gives. Which would you rather be? A purse? or a Dog?